The road map for the Atomic Game Engine, which we looked at late last year, was just released and highlights upcoming developments for the engine. New WebSite - We need a new website, badly. The main page and landing video have not been updated since the initial March 4th Early Access! In addition to the roadmap, a thorough history of the engine and the company people it are available here. The release schedule seems to be really picking up on the Shiva engine. Last year was months of silence with very few releases, while this release comes just under 2 months since the prior release. 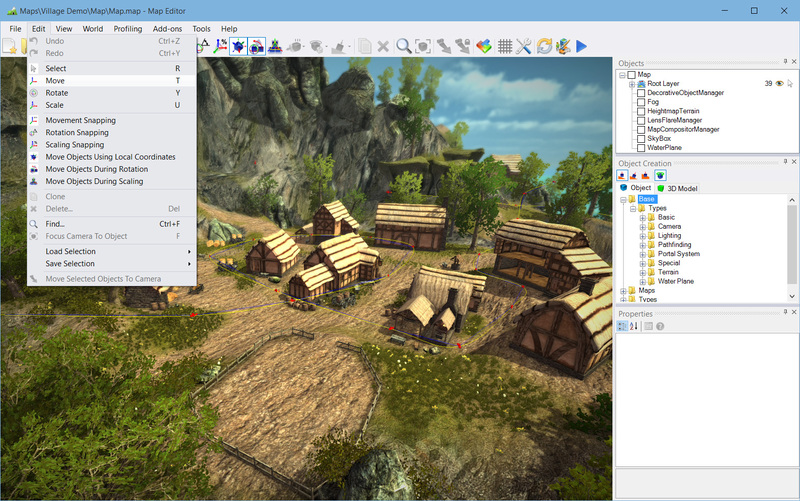 Shiva is a C# based game engine with a WYSIWYG world editor. Now in the 5th release of Beta 2, this release adds two new modules as well as several bug fixes and changes. The focus of ShiVa 2.0 Beta 5 are the new HUD and Font modules, which means you are now able to open, edit, or create new 2D User Interfaces within ShiVa 2.0. Apart from the cleaner organization of the panels, the new HUD editor also has a very nice new trick up its sleeve. You can now click a new button that allows you to preview HUD actions right within the module, without loading your actual game. This can be a huge time saver, especially if your newly designed HUD only comes up in certain gameplay situations a few hours into the game. You can also test the interaction with the buttons, sliders, checkboxes etc. and trigger their events. When Play is enabled, you can also execute actions from HUD outliner: Simply right-click on an action, then choose "Run". If the action has to call an argument, a dialog box will pop up and ask for values. You can even test AIModel interaction: If you send an action to an AI, the editor will report it by telling you "should send AI message: yourvalue". Sound on tvOS is back. We are sorry for including the wrong engine in beta 4, but this new version should fix the audio issues most of you were experiencing. Touch on WinRT Mobile has also been fixed. Some developers were reporting errors in certain screen corners, those problems should be solved. CYGWIN for BlackBerry and Android compilation on Windows is back too. Although we still recommend compiling those platforms on OSX or Linux where cygwin is not required. Cleaning up the new rendering pipeline continues as well. Especially VR developers will be happy to hear that a shader compilation bug has been fixed that was holding them up. You can learn more about ShivaEngine on their website. You can read more details, along with in-depth examples of each new feature in this release, by clicking here. Ever answered the question “If you could have any super power, what would it be?” Myself, I’d go with whatever Superman has, as he seems to have the power to do whatever the heck he needs to have the power to do at any given time, so long as people don’t shove rocks from a dead planet at him... However, if you answered “I want to have the power of collaborative game development!” 1) you need to think bigger 2) you are in luck! Superpowers is a recently open sourced collaborative game engine for making 2D and 3D games, using TypeScript initially with Lua a WIP. It’s built around HTML5 web technologies but isn’t really a browser game engine. It’s available for Windows, Linux and Mac OS and it’s completely free, although I’m pretty certain the devs would appreciate some financial support should you find yourself digging it. This on the other hand, as in this document you are reading right now, is the first part of a multi part tutorial series teaching you how to use Superpowers. We are going to break this tutorial series across several posts, each covering a particular theme. By the end though, you should be pretty well equipped to make your own game using the Superpowers engine. So without further ado, let’s begin. Now that you’ve got the file downloaded, simply extract it to whatever directory you want to run Superpowers from. In my case I chose d:\dev so Superpowers is installed in D:\Dev\superpowers-0.19.0-win-x64. And done. Not exactly the most difficult install process you are going to encounter, eh? Now locate the file superpowers (+ .exe on Windows) and double click it. This is the Superpowers welcome screen, it may not be immediately obvious but click on the image of the kids to launch the engine proper. Now we are brought to the Superpowers server window. Next create a server. Simply click the ‘Add server’ button. Don’t worry, we only need to do this part once. It will then prompt you for an IP address, and defaults out to 127.0.0.1:4237, which is a loopback or friendly way of saying “this machine”. If you don’t have any reason to change this, don’t. If you are running on a server and are going to be working externally with other developers you will use whatever your servers external IP address is instead. Click ‘Add server’ again. Now we create a new project... bet you can’t guess how. Ok, here’s how, click New project. Alright, that’s it for this tutorial. We now have Superpowers installed, running and created our first project. Click Next Part below to continue on to the, um, next part. NeoAxis, a C# based game engine with a rich tool suite including a full map editor, just released version 3.4. A somewhat minimal release in anticipation of version 4. Latest PhysX 3.3.4. Works faster and is more stable. Good character physics, improved car physics, fixed terrain problems. OS X support has been improved. New Mono Runtime 4.2.1 with new Generational GC (SGen) support. OS X 10.8 now is the minimal supported system. Sound backend has been improved. OpenAL Soft updated up to 1.17.2. Internal SSE optimizations. All example maps have been updated. Better object selection algorithms in Map Editor. It's now easier to select zones, portals and other volumes. Post processing: Color correction lookup table support. 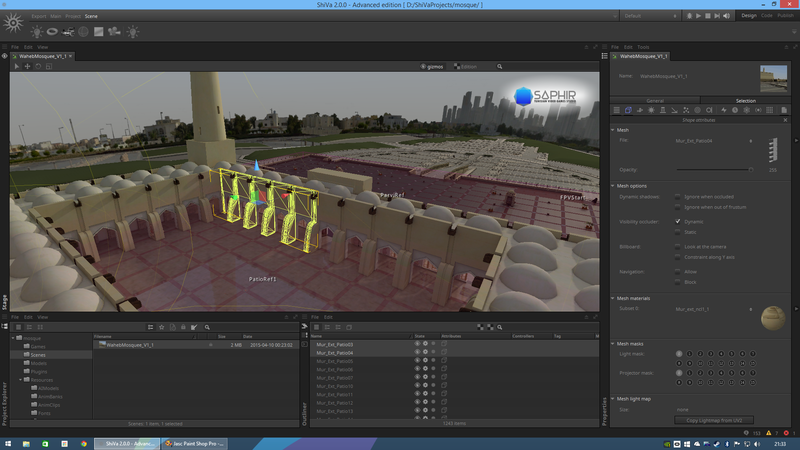 Exporters: support of the latest Autodesk 3ds Max 2016 and Maya 2016. Ability to install exporter for yet unpublished versions of 3ds Max and Maya (2017+) added. Exporters: Ability to install exporters to a specified folder. File system: The ability to load archives during simulation. As example to use it for downloadable content. Map Editor: Ability to open the type of selected object in Resource Editor. Use context menu. MapCamera: Ability to set orthographic camera. Web Browser Control: You can now configure a local HTML start file. Zooming and mip maps generation for in-game 3D GUI. Bug fix: Native memory manager: Crash Memory_AllocAligned on 64-bit applications. Bug fix: Exporters: Unable to override material in some cases.